It's time for our monthly Creative Challenge and this month it is all about Christmas. You'll want to check out the MFT Blog to see all the fabulous creations the Design Team has to share with you. 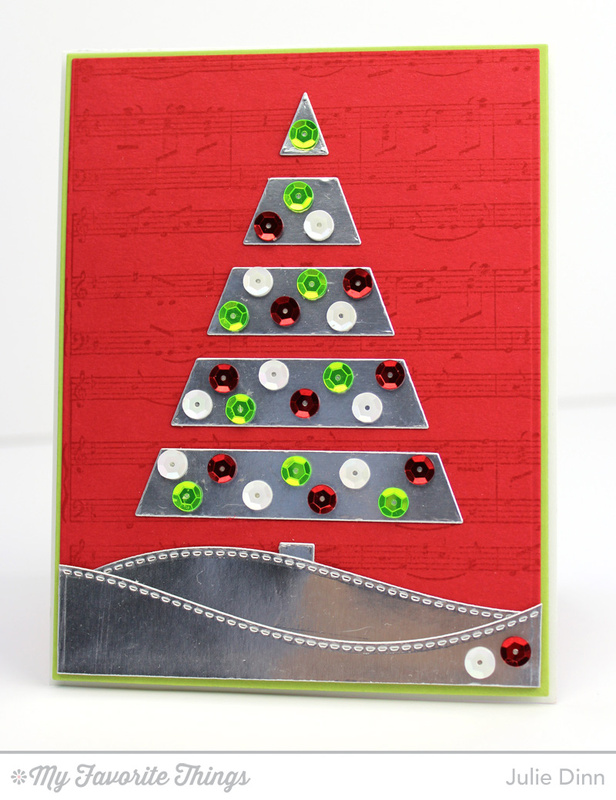 I have two cards to share with you today, both feature the fabulous Christmas Tree Cutout Die-namics. One of the things that I love about this die, is that it looks great no matter how you use it. For my first card I created a shaker card with it. I die-cut the tree on a gold Stitched Rounded Rectangle and I added a piece of acetate to the back of the rounded rectangle. There is just enough room between the different tree pieces to apply thin strips of foam tape. 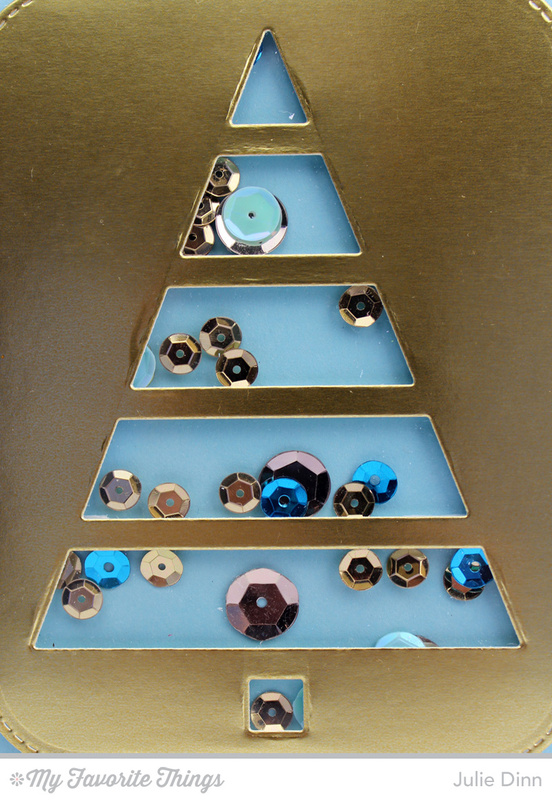 A handful of sequins were placed in each section of the tree. I covered the back of the rectangle with a Berrylicious Stitched Rounded Rectangle. 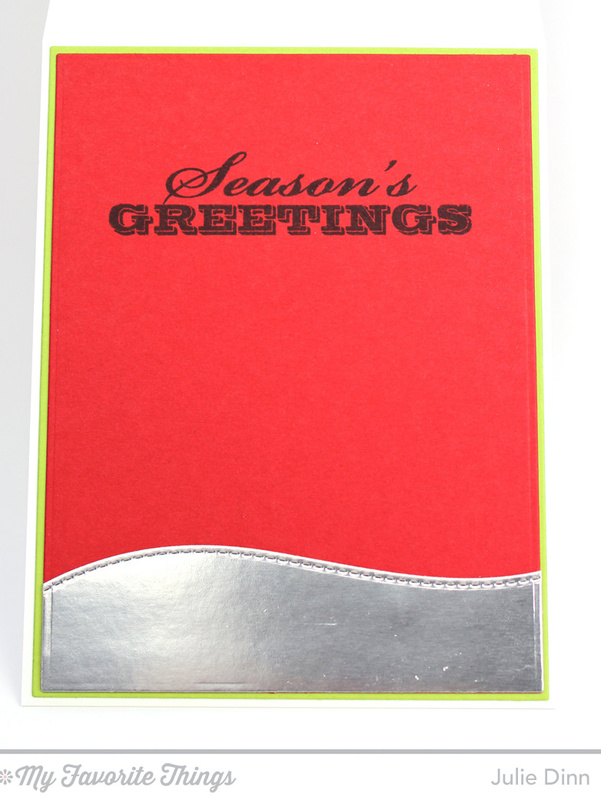 On the inside of the card, I used the Christmas Greetings Die-namics for the sentiment. For my second card, I used the die in a different way. I used the pieces that are cut out, instead of the negative image. 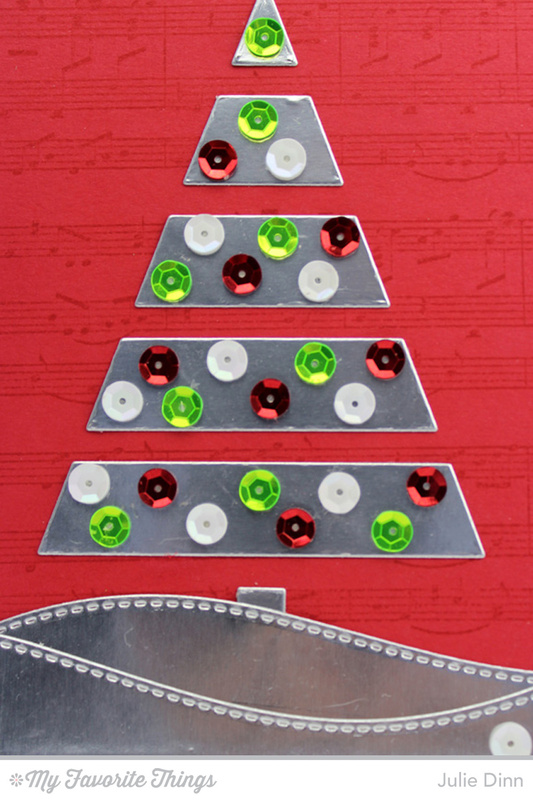 I placed the silver tree pieces on a piece of Red Hot card stock that was stamped with the Sheet Music Background. I used the cut out negative of the die as a template to line up all the tree pieces. The pieces were decorated with lots of brightly coloured sequins. Along the bottom of the card, I added a few Stitched Snow Drifts. On the inside of the card, I stamped a simple sentiment from the Seasonal Sentiments stamp set. Thanks so much for joining me today! Don't forget to check out the MFT Blog to see all the fabulous Christmas ideas the team has to share with you. These are fantastic! 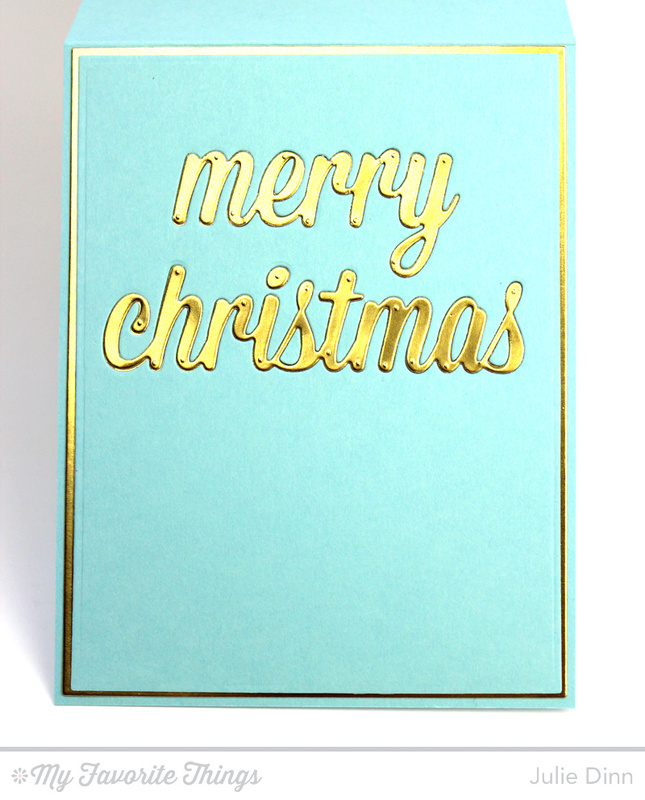 Love that you chose gold and silver foil card stock. Sets the trees and wording off beautifully! 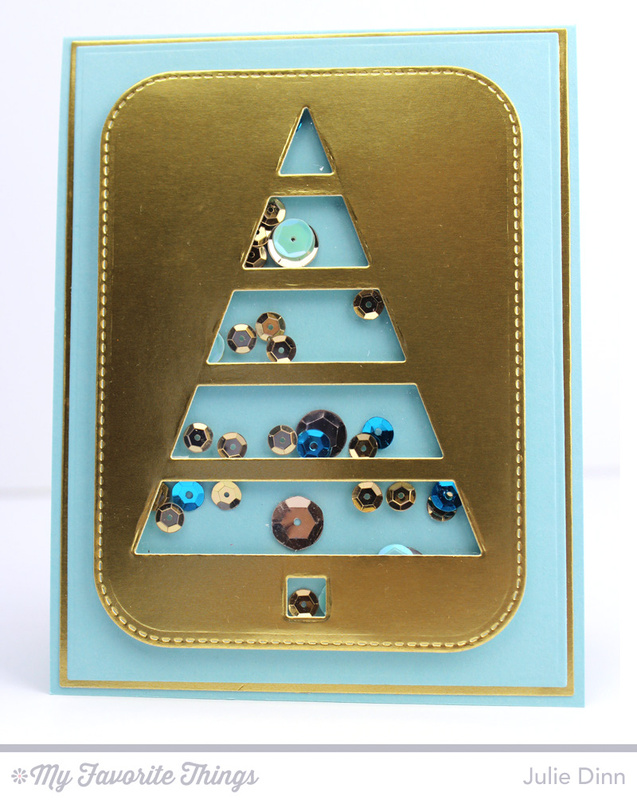 Beautiful Christmas tree cards. I really must try that shaker technique with that die, it's so awesome.